Kings XI Punjab (KXIP) and Royal Challengers Bangalore (RCB) have encountered 22 times in Indian Premier League (IPL). Out of the 22 matches Kings XI Punjab is leading by winning 12 matches and Royal Challengers Bangalore have won the remaining 10 matches. In last 5 matches, Kings XI Punjab has won 2 of them and Royal Challengers Bangalore have won 3. In IPL 2018, both matches between Royal Challengers Bangalore and Kings XI Punjab was won by Royal Challengers Bangalore. 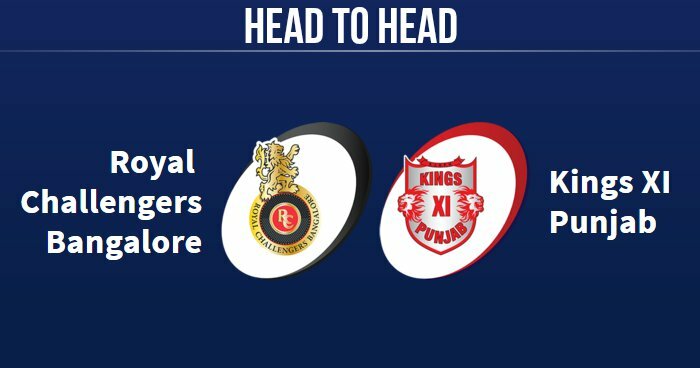 Kings XI Punjab and Royal Challengers Bangalore will be playing their next match against each other on 13 April 2019 in IPL 2019 at IS Bindra Stadium, Mohali.